The Bathsheba Freestanding Stonecast bath is a luxurious oval bath that is designed to accommodate dual bathing . 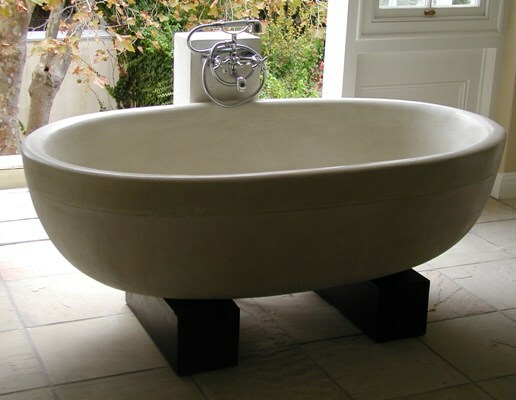 Our Bath is made out of heat resistant polymer fibreglass with a cut-sandstone finish so that it is fully functional as a standard bath but has the natural quality and colour of sandstone. 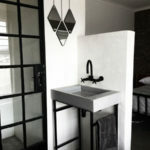 A real stone bath would crack with the hot water in it , and it will be so heavy as to render it almost impossible to deliver and install. The central waste accommodates a standard Basin Clicker Plug but this can be enlarged to accommodate a bath waste on request. This must be unslotted as there is no overflow hole on our bath. An over flow hole can, however, be included at an extra cost and also on request. Although most of our baths resemble natural sandstone in colour and texture , the resinous materials used in manufacture allows us to make any colour requested. The internal cavity in our bath wall construction is filled with Polyurethane foam which is an excellent way of insulating the bath to retain the hot bath water for longer. It is also lightweight and adds only a few grams to the overall 120 kg weight. The underside of the base of the bath is filled with concrete so that it is well balanced. 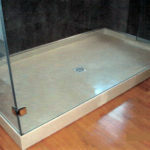 The bath can be placed directly on the floor or placed on concrete Bath Blocks at a height of 160mm which is required for the efficient flow of bathwater out of the plughole. Custom sizes and shapes of baths to client specification can also be manufactured in the same way as we construct our own Bathsheba Bath. These are for quotation only.